CNN's Andrew Stevens manages a smile despite having to board a helicopter after several hours of commercial flight delays -- as a huge typhoon made its way toward the Philippines. 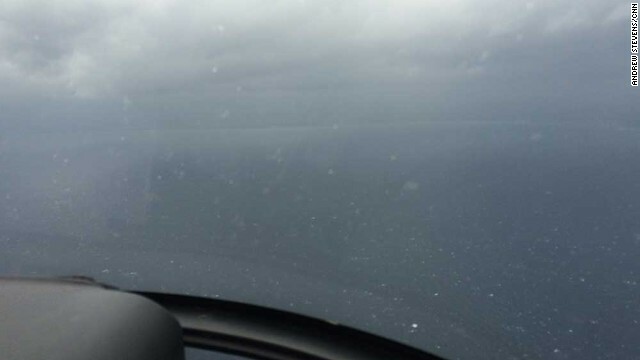 Visibility was low as the helicopter took off from Cebu en route to Tacloban. Stevens' pilot, retired military man Col. Andy Largo, said his biggest worry was that strong winds could snap the rotor blades. Sensing trouble in dark clouds ahead, Col. Largo lands the plane in a field, hours from Stevens' final destination. On the move again. 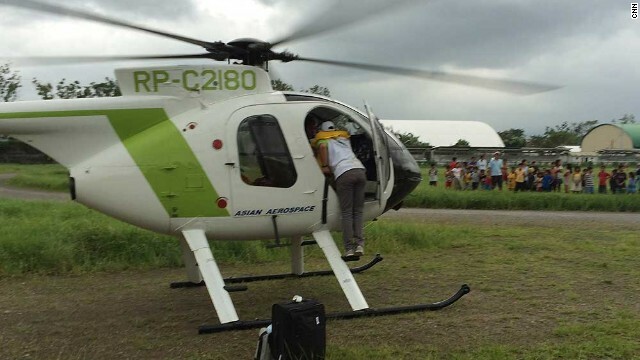 After jumping out of the helicopter, locals helped Stevens rustle up a van for the 100 kilometer journey to Tacloban. Finally there! The coastline in Tacloban is a welcome sight after 31 hours of travel. 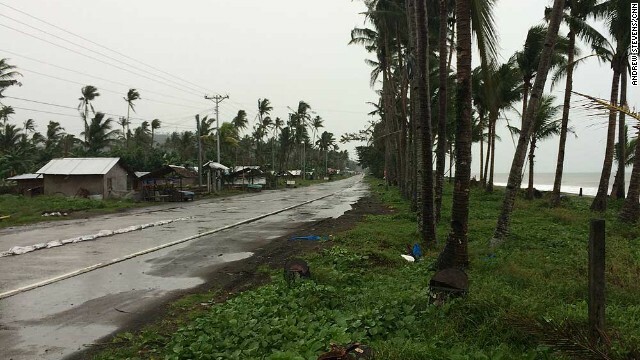 Manila to Tacloban, the Philippines (CNN) -- The weather forecasters had warned that Hagupit was one of the most unpredictable storms in memory. 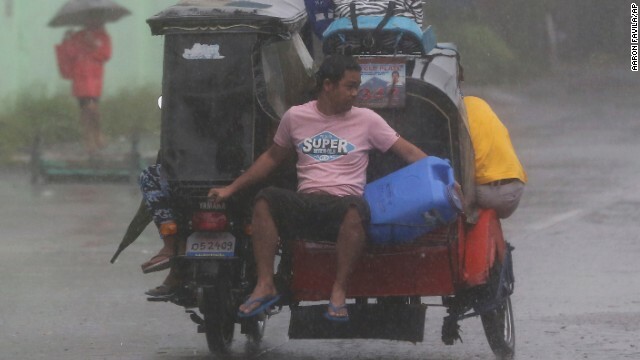 Three of the world's leading weather agencies came up with three different paths for the storm as it slowly, but relentlessly, bore down on the Philippines packing winds in excess of 200 kilometers per hour (124 mph). For me, that unpredictability turned traveling from Manila to Tacloban from a routine 90-minute flight into a 31-hour slog. I needed to be there to cover the typhoon's impact on a town traumatized by the impact of Super Typhoon Haiyan last year. It looked pretty simple at the beginning. Jump on the Cathay Pacific flight from Hong Kong, head straight for domestic departures, where I would then board a flight to Tacloban -- a flight of little more than an hour. 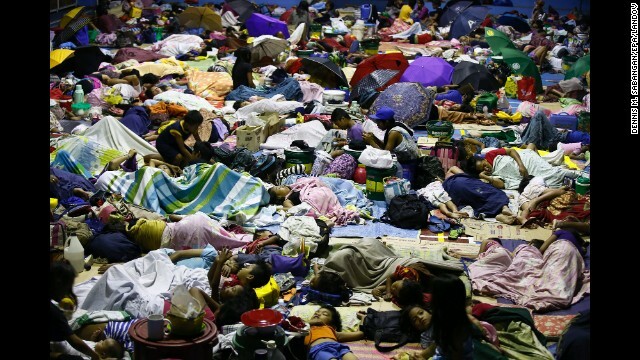 People seek refuge inside a temporary evacuation center in Quezon City, Philippines, on Tuesday, December 9. 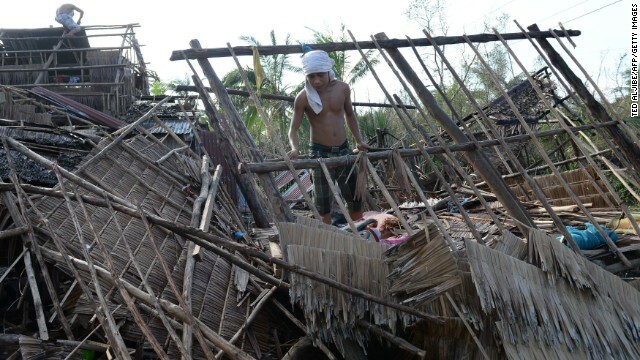 Typhoon Hagupit tore apart homes and sent waves crashing through coastal communities across the eastern Philippines. 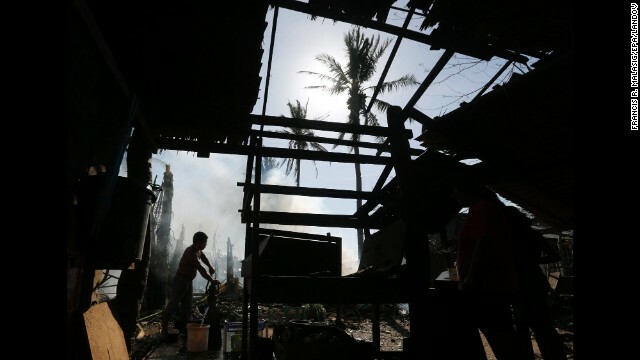 Residents try to salvage materials from destroyed houses in San Julian, Philippines, on December 9. 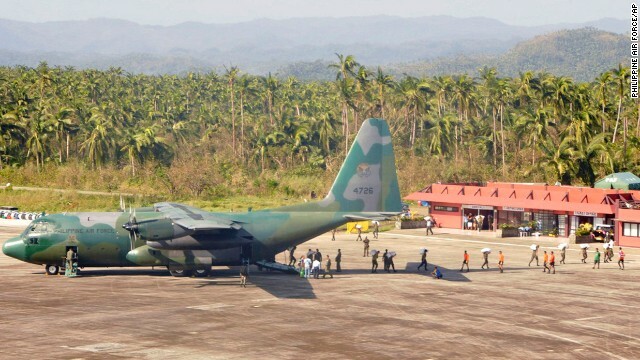 A Philippine air force cargo plane unloads tons of relief supplies in Borongan, Philippines, on December 9. A man collects water near a damaged home in Dolores, Philippines, on Monday, December 8. 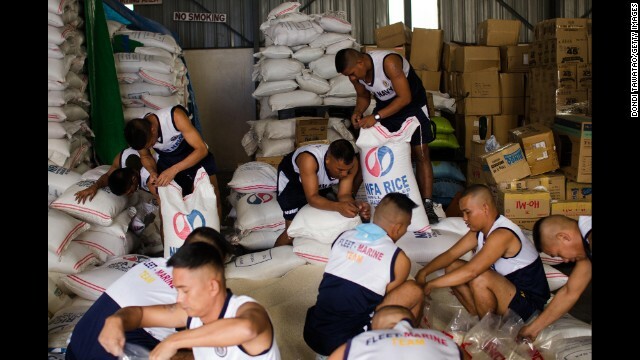 Philippine navy personnel pack rice packages at a government distribution center in Manila, Philippines, on December 8. 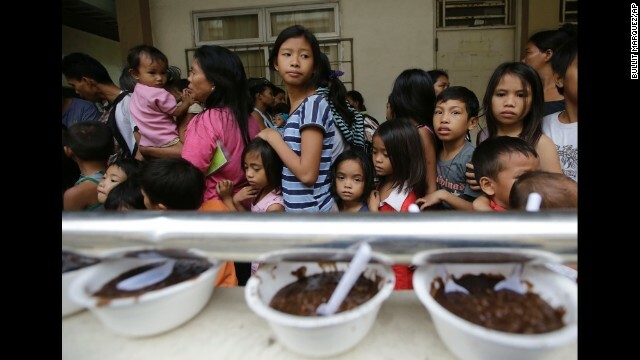 Evacuees line up for food at an evacuation center in Manila on December 8. 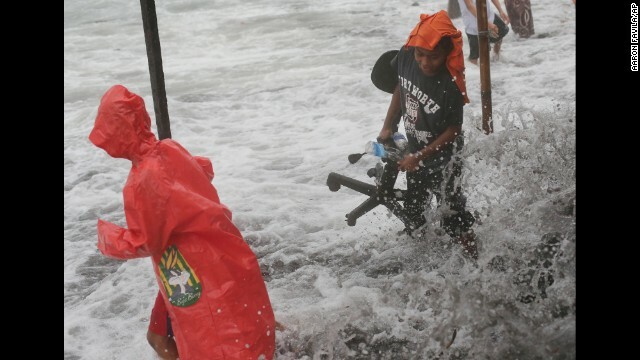 Boys salvage items as they return to their homes in Legazpi, Philippines, December 8. 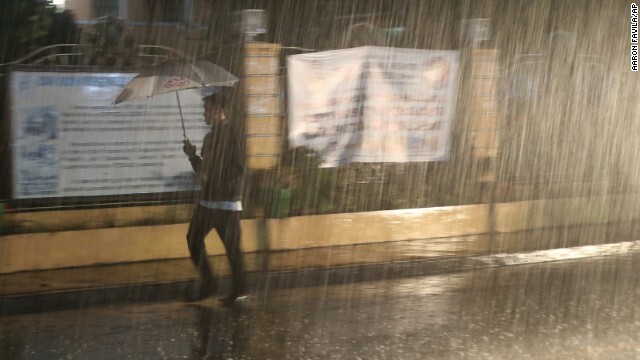 A man walks through heavy rain in San Juan, Philippines, on December 8. 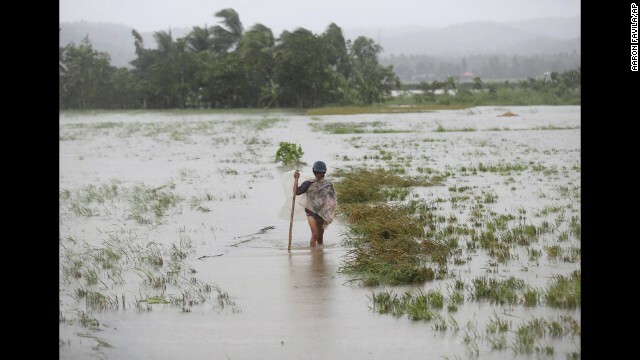 A man wades through a flooded rice field in Albay province of the Philippines on December 8. A man carries a dirty plastic sheet from his house in Legazpi on December 8. 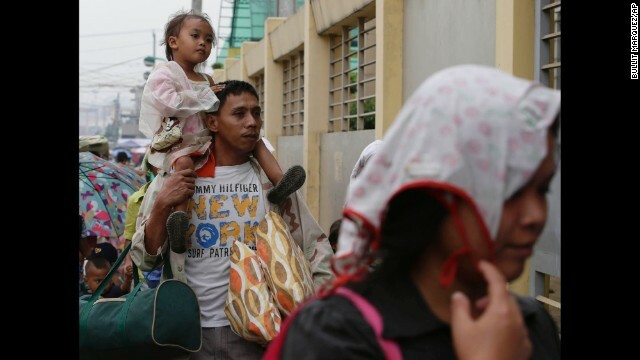 Manila residents evacuate December 8 to safer ground after the local government ordered pre-emptive evacuation in anticipation of Hagupit. People check their damaged home in Legazpi on December 8. 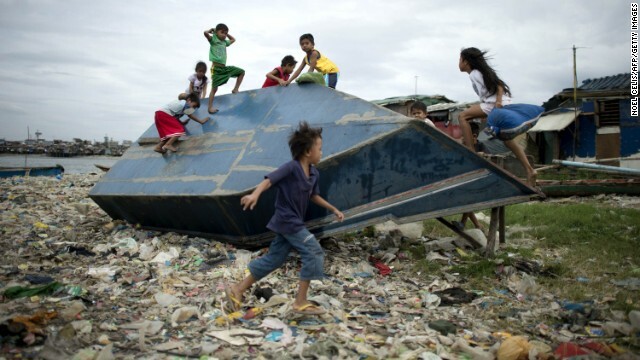 Children play on an overturned boat at the port area of Manila on Sunday, December 7. 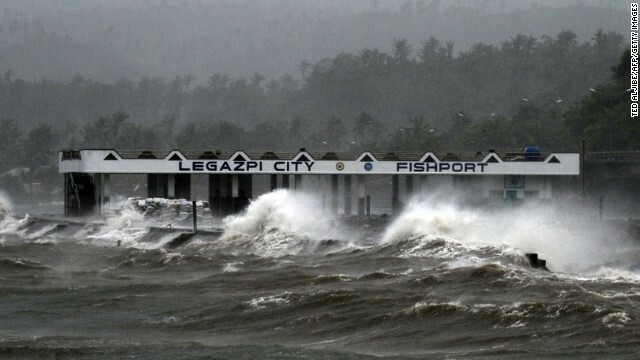 Strong waves crash into coastal houses in Legazpi on December 7. 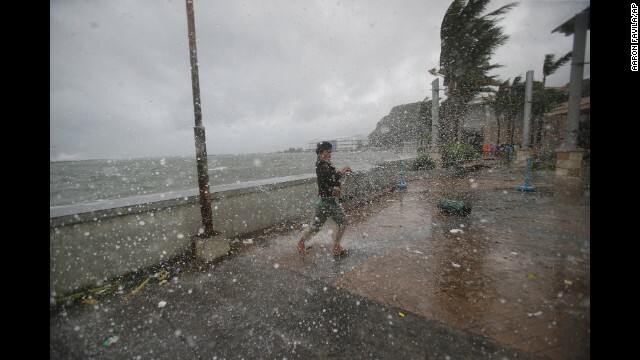 Strong winds and rain push a man around on the shore in Legazpi on December 7. Residents head for an evacuation center on December 7 as strong winds and rains hit Legazpi. 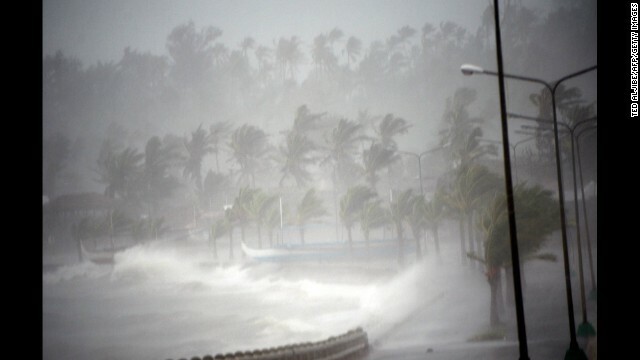 Strong winds and rain pound the seawall in Legazpi on December 7. 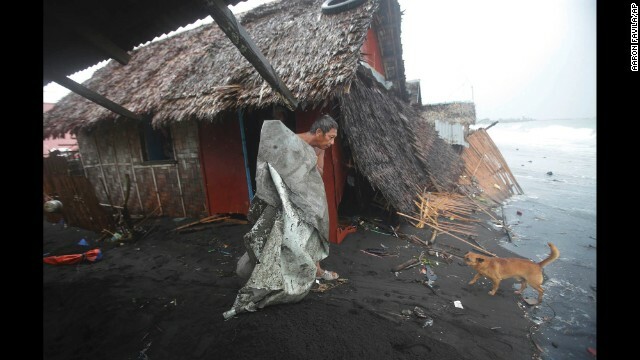 A man holds on as strong winds from Typhoon Hagupit hit Legazpi on December 7. 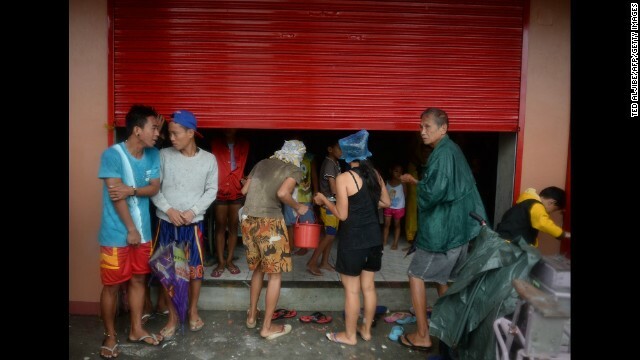 Residents take shelter in an unfinished building hours before Hagupit passes near Legazpi on December 7. 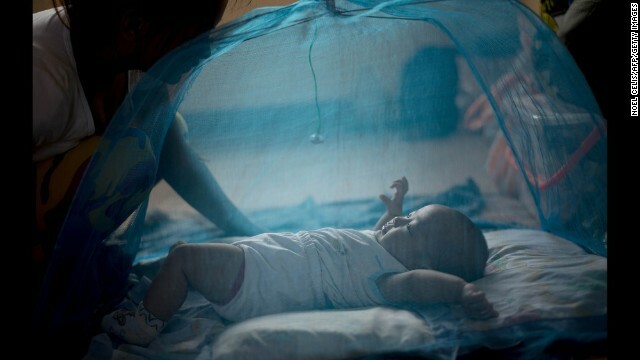 A mother watches her baby inside a mosquito net at an evacuation center in Manila on December 7. 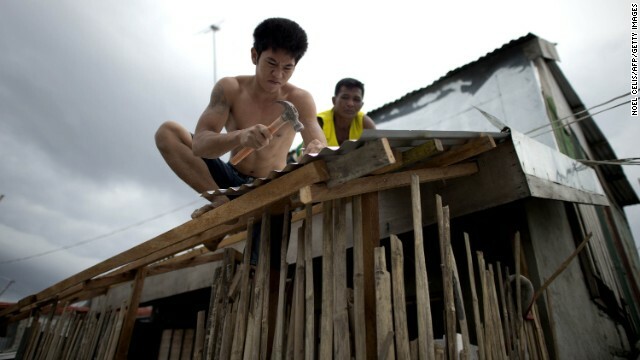 Workers reinforce the roof of a house in Manila on December 7. 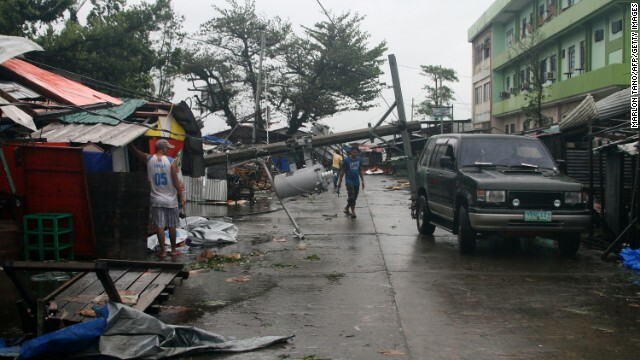 A man walks under a fallen utility pole in Tacloban, Philippines, on December 7. 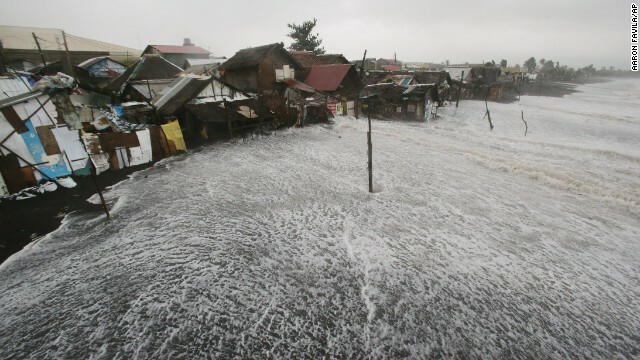 Typhoon Hagupit whips up waves in Legazpi on December 7. 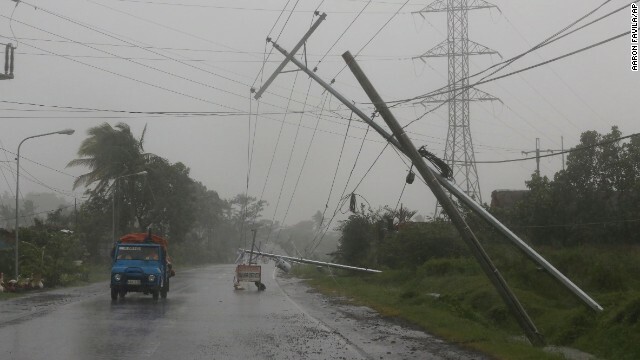 Motorists pass toppled utility poles in Camalig, Philippines, on December 7. 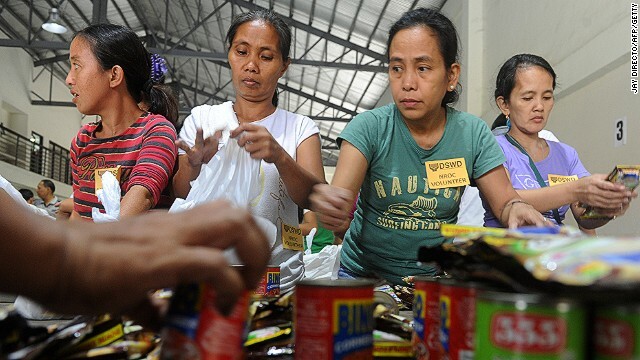 Volunteers repack relief goods in Manila on December 7. 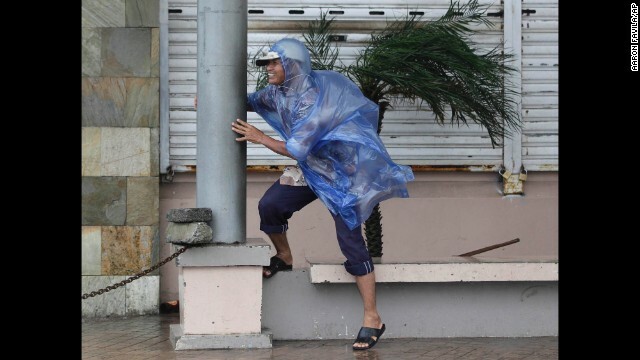 A policeman carries a tree branch that fell due to strong wind in Legazpi on December 7. 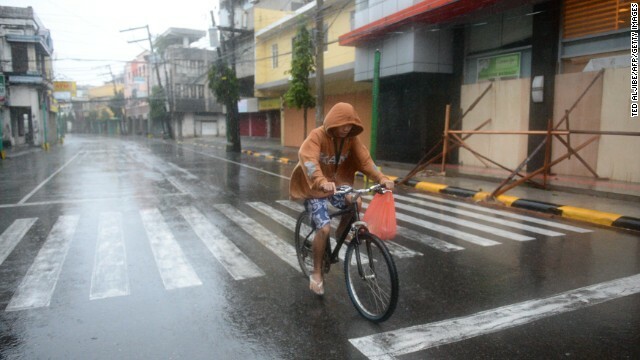 A resident cycles down an empty street before Hagupit passes near Legazpi on December 7. 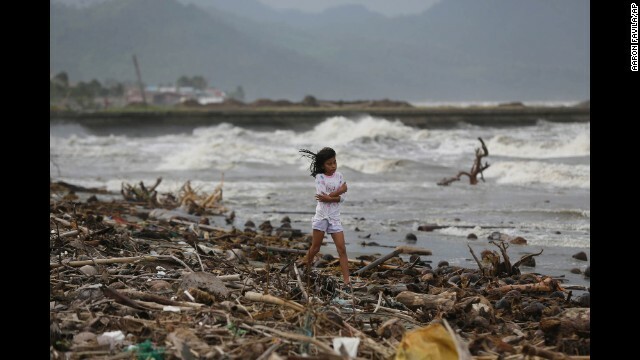 A girl walks along the shore as strong waves hit Atimonan, Philippines, on Saturday, December 6. A boy watches as a wave hits the seawall on December 6 along the boulevard in Surigao City, Philippines. 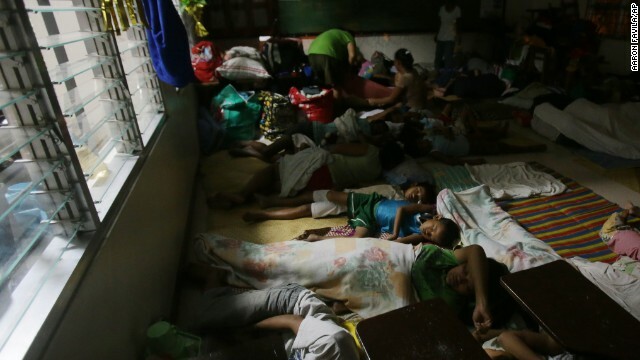 Families sleep at a school used as an evacuation center on December 6 in Legazpi. 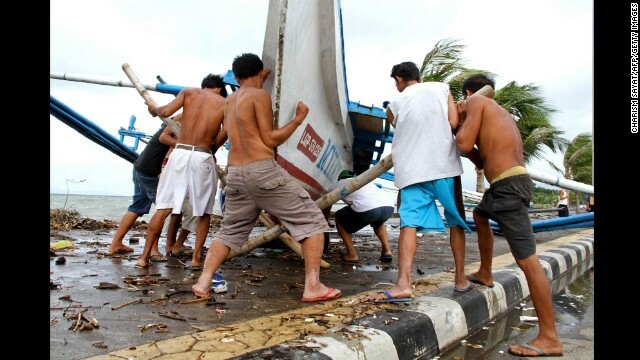 Fishermen carry their outrigger to higher ground in Legazpi on Friday, December 5. 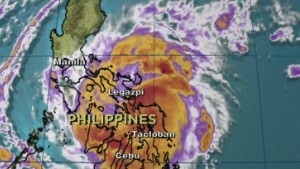 More than 600,000 people had evacuated by Saturday morning, according to the National Disaster Risk Reduction and Management Council. 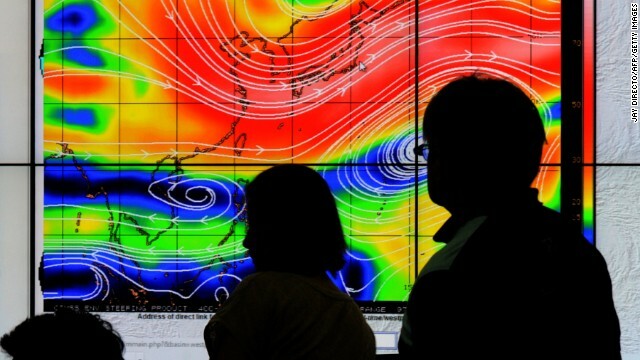 Meteorologists from the Philippine Atmospheric, Geophysical and Astronomical Services Administration plot the direction of Hagupit on Thursday, December 4. 10:30 a.m. came and went with no sign of a boarding call. I began to meet other journalists waiting for the same flight who were equally at a loss as to what was happening. We were eventually approached by a Philippines Airlines manager, apologizing profusely. "Technical difficulties" had apparently grounded the aircraft but we were assured there would be another flight at 1.30 p.m.
All other flights to different parts of the Philippines were on schedule, so we were confident about this next take-off time. But as the time approached, no boarding call came. A brief announcement informed us the flight was canceled because of continuing "technical difficulties." And so it went. Another airlines staff member presented us with new boarding passes for a 3.45 p.m. flight. Fifteen minutes before departure we were sitting patiently on the airport bus waiting to be taken out to the apron and it looked as if we would finally be on our way. But the bus didn't move. We sat for 30 minutes until another announcement of another delay. We trudged back to the boarding gate, very frustrated. Other routes were being discussed but all ferries had been canceled and the direct flight still looked the best bet. 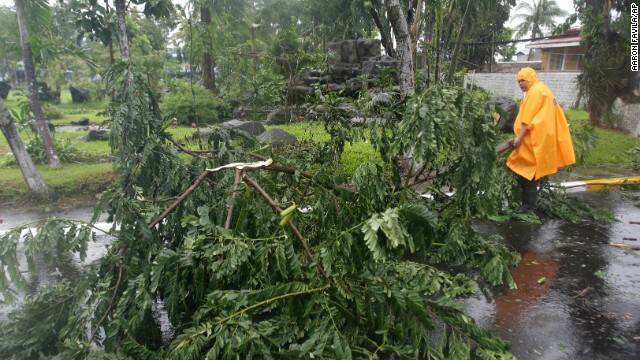 More than an hour later we learned that all flights were canceled because of the weather conditions in Tacloban. We appeared to be stuck where the story wasn't. And so to Plan B. A hasty conference call with the Hong Kong news desk and a new plan: Charter a light aircraft. Initial indications were good. A private operator thought they could get a few of us into Tacloban at first light Saturday. 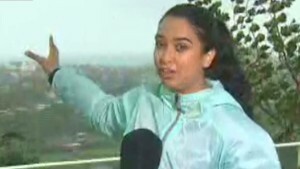 The final decision on weather conditions would be made at 4 a.m. At the appointed time the news came through: Conditions were too dangerous to risk it. Another call to Hong Kong and we decided that it could be possible to fly to Cebu and take the short hop to Tacloban by helicopter. I boarded my flight at 11 a.m. and was on the island inside the hour to be met by the helicopter crew. I knew I was in good hands when I met my pilot, retired military man Col. Andy Largo. His flying career included flying four former Philippine presidents around the country, as well as the late Pope John Paul II. He had already flown two sorties that morning to Tacloban but my anxieties grew as he described the flights. He was forced to touch down early on both journeys because of the conditions -- and they were growing worse by the hour. The biggest worry, he said, were strong wings that could literally break the rotor blades. If we encountered excessive winds he would reduce the flying speed and edge ahead, waiting for a break in the weather. I was his only passenger but he took along an engineer to help "just in case." I buckled into the front seat next to Col. Largo and off we went into a murky cloud-filled sky. It was surprisingly smooth. We flew at between 1,000 and 2,000 feet over a white-capped sea, towards increasingly thick clouds. 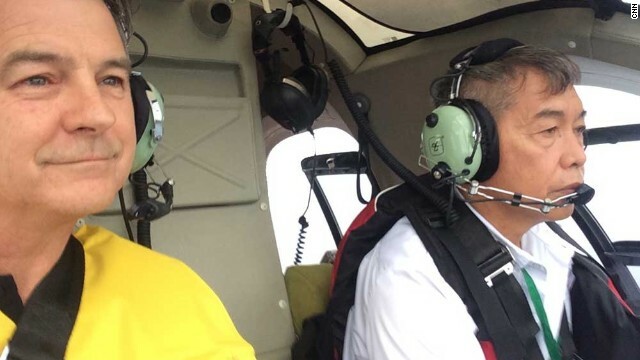 Our pilot seemed unworried until we got to the tip of Leyte Island and the town of Beybey, which lies at the foot of a range of mountains separating us from Tacloban. One look at the cloud ahead and he tapped me on the arm and indicated the flight had come to an end. We put down on a playing field and I jumped out. I was soon surrounded by a group of locals, who managed to rustle up a van. 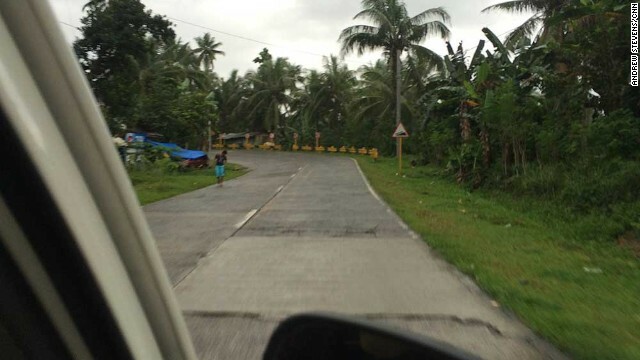 Ten minutes later we on the road driving along a virtually deserted road in heavy rain, towards the mountains and Tacloban. It took two hours to make the 100 kilometer (62 mile) journey. At 4 p.m., 31 hours after touching down in Manila, I finally arrived at my destination.